They don't run into any liability issues by accidentally interfering with a user’s personal data. Device users can't create or use the Knox Workspace if the device is compromised due to unauthorized boot loaders or unauthorized modifications. A malicious process in the personal space exploiting the mapping of kernel data. Privileges of processes running in the personal space escalating to allow access to data in the Workspace. The Knox Workspace provides an IT admin with granular management policies to address the challenges of maintaining personal and work data on the same device. With the isolation of work and personal data, a device user has access to two separate spaces. To increase productivity in certain situations, it is often required to share data from one space to another. For example, while using a phone app in the personal space, it may be necessary to call a work contact saved in the secure work space. With the Knox Workspace, an IT admin has the granular management policies to manage the import and export of data to and from the Knox Workspace. This data can include apps, files, clipboard data, call logs, contacts, calendar events, bookmarks, notifications, shortcuts, and SMS. With the isolation of work and personal data, the device user has access to two separate spaces. This dual access presents some challenges to quickly identify and access work data. To enhance usability, the Knox Workspace provides an IT admin the ability to add work shortcuts to their personal space so they can quickly access work data. The Knox Workspace also provides an IT admin with the ability to set custom resources, such as work badges on app icons so a user can quickly identify their company’s work apps. An enterprise IT admin must ensure only authorized people have access to work data inside container. 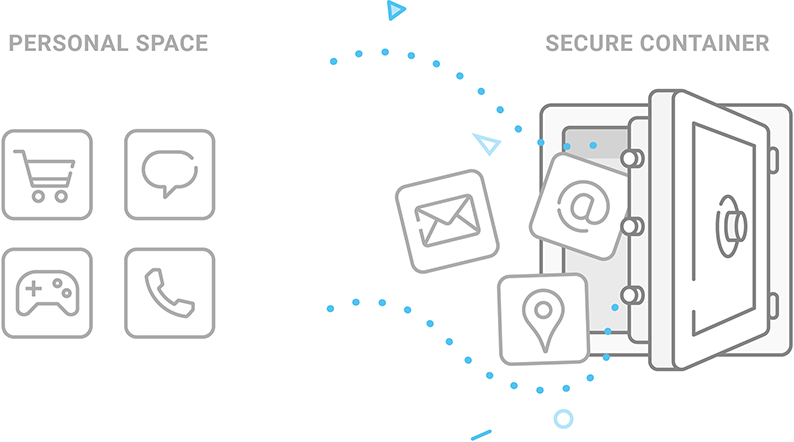 The Knox Workspace supports advanced authentication mechanisms to meet all enterprise needs. Additionally, an IT admin can lock the container to restrict access. This restriction is necessary when a device is out of compliance, lost, or stolen.